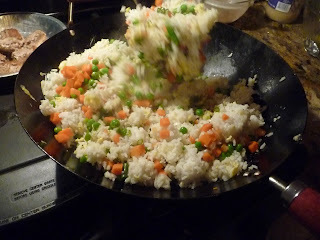 Remember a couple of months ago when I made the Best Fried Rice? 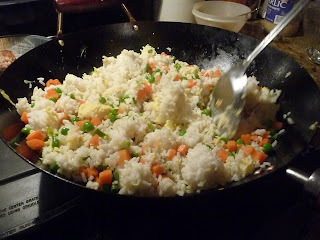 Well, I think we managed to make the Second Best Fried Rice. 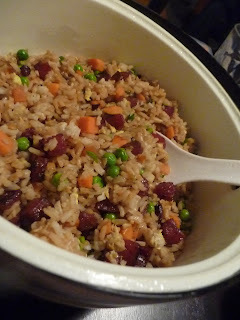 It’s pretty similar but this is Uncle Woody’s rice, and it deserves to be seen. 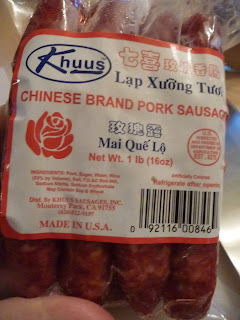 Plus, it includes Chinese sausage. Which, now that I think about it, is what Craig Claiborne and Virginia Lee’s rice originally called for. I just used bacon instead. 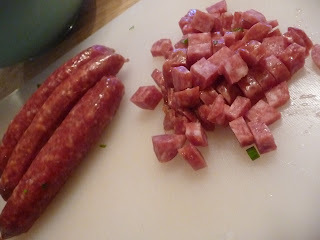 I really enjoyed the flavor and texture of this sausage though–it was sweet and had a firm texture. I feel sausage experiments coming on. It also has a pleasantly unnatural red color. 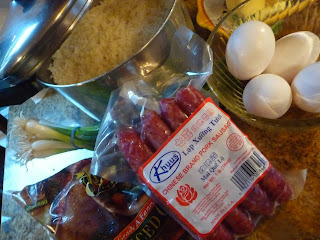 For the rice, we’re going to cube the sausage. Woody cooked the sausage first and then set it aside. Next, he scrambled the eggs. 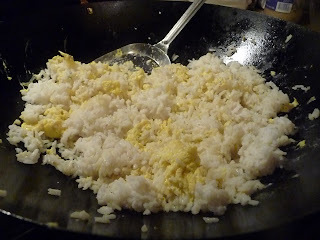 Then add in the cooked rice. Add in the cooked vegetables and scallions. Add back the sausage. Season with oyster sauce and soy. I could probably eat fried rice every day. 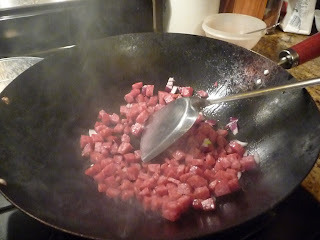 In a wok or large saute pan over high heat, stir fry the sausage cubes. Set aside. Add 2 tsp oil. 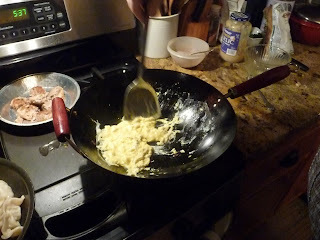 Pour in the eggs and stirring constantly, scramble until softly cooked. 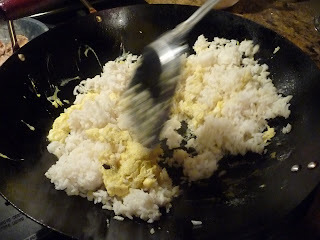 Add the rice and stir through. Add the vegetables and scallions. Stir through until hot. Add back the sausage. Stir through. Add 1-2 Tbsp oyster sauce and stir through. Season with a bit of soy sauce to taste.